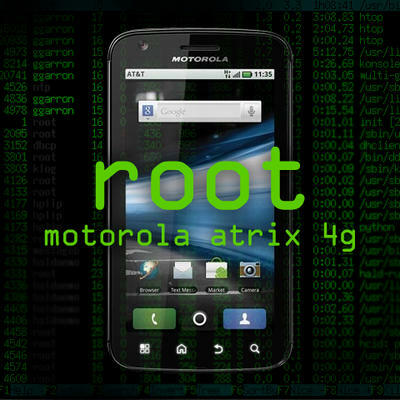 Despite just being released today, the continually impressive Android modding community has already gained root access to the Tegra 2 packing Motorola Atrix 4G. If you've never owned an Android device, or are new to the hacking world, rooting essentially means gaining full control over your device. It can enable you you remove carrier bloatware, install a custom ROM, sideload applications and more. It may sound a bit intimidating, but the folks at Briefmobile have put together a simple easy to follow guide that makes the process incredibly easy. A word of warning before you proceed however, rooting will void your warranty (assuming it's in that condition when you bring it in). The below method, while published by Briefmobile, was developed by famed modders DesignGears and Getaphixx. Mount the device for Media Sync. Motorola Helper will install proper drivers. Or, go here and download and install the proper drivers if you cannot get your phone recognized. After installing the drivers, meeting the prerequisites, and downloading CLShortFuse's Super One Click, proceed to the next step. Menu >> Settings >> Applications >> Development >> Enable "USB debugging"
Before rebooting, click "Allow Non Market Apps"
That's if folks, you now are ready to tinker around with your rooted Motorola Atrix 4G. If reading is not your thing, Getaphixx has posted video instructions as well. Disclaimer: We have not tried this method ourselves, but have received confirmation that it works.